The current Toyota is better than its Lexus counterpart, but not for long. The ES 350 is a strange model in the Lexus lineup. While other Lexus sedans are rear-wheel drive, aiming to tackle the likes of BMW, the ES is based on the FWD Toyota Avalon and targets an older demographic, which cares . Toyota already redesigned the Avalon for the 2019 model year, but the ES 350 is in need of the same treatment. A highly refreshed 2019 model is on the way, but so far Lexus has kept it quiet—until now. An image from has given us our first look at the all-new 2019 Lexus ES 350. The full reveal is scheduled for April 25th at the 2018 Beijing Motor Show, but for now we have some idea of what the new ES will look like. The image only shows the heavily revised front end, which clearly . The signature spindle grille looks smaller and less intricate on the ES compared to the LS, which is understandable given the massive price gap between the two sedans. It is very unlikely the new ES will divert much from the Camry and Avalon, which are also based on Toyota's TNGA platform and built in the same Kentucky plant. This is good news for the ES because the Camry and Avalon currently outshine their luxury counterpart. The new ES 350 will likely drop its current 268 horsepower 3.5-liter V6 and six-speed automatic transmission in favor of a revised engine with 301 hp and a smoother eight-speed automatic. A hybrid ES 300h model should also be available with a 2.5-liter hybrid drivetrain. We'll only have to wait until the end of the month to see how Lexus improves its best-selling sedan. Don't come near this car if you call yourself a gearhead. For everybody else, the line starts here. 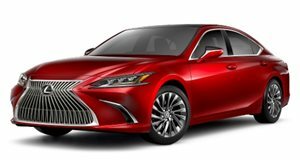 With shared emphasis on value and comfort, the Lexus ES is an ideal candidate for buyers looking for a more affordable and supple mid-sized executive sedan.